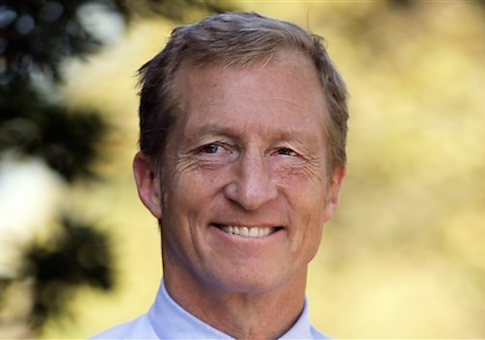 Billionaire Democratic donor Tom Steyer has tapped a former White House staffer to head up communications at his climate change organization, NextGen Climate. Politico reported that Andrea Purse, formerly the director of broadcast media at the White House, will become the head of communications for NextGen. She also previously worked as vice president of communications at the left-wing think tank Center for American Progress, which helped the Environmental Protection Agency develop talking points designed to sell its controversial power plant regulations to journalists in 2013. Steyer, who poured $5 million into his super PAC NextGen Climate Action in late May, has yet to publicly back a candidate for president, though early signs indicate that Hillary Clinton will secure his endorsement. He and his wife hosted a fundraiser for Clinton at their home in California in May, and Steyer has been a longtime Clinton supporter. The report of Steyer’s new hire comes just as Clinton takes a bold stance on the environment, accusing her Republican foes of denying "the settled science of climate change" and vowing to implement major policy changes to combat global warming on her first day in office. In a new campaign video, Clinton says that, as president, she would have over half a billion solar panels installed in the United States before the conclusion of her first term and would ensure that the country is capable of powering every home in America with renewable energy within a decade. However, Clinton has yet to take a position on the Keystone XL pipeline, which was a key issue for Steyer’s political action committee in the 2014 midterm election cycle. This entry was posted in Politics and tagged Center for American Progress, Hillary Clinton, Tom Steyer. Bookmark the permalink.